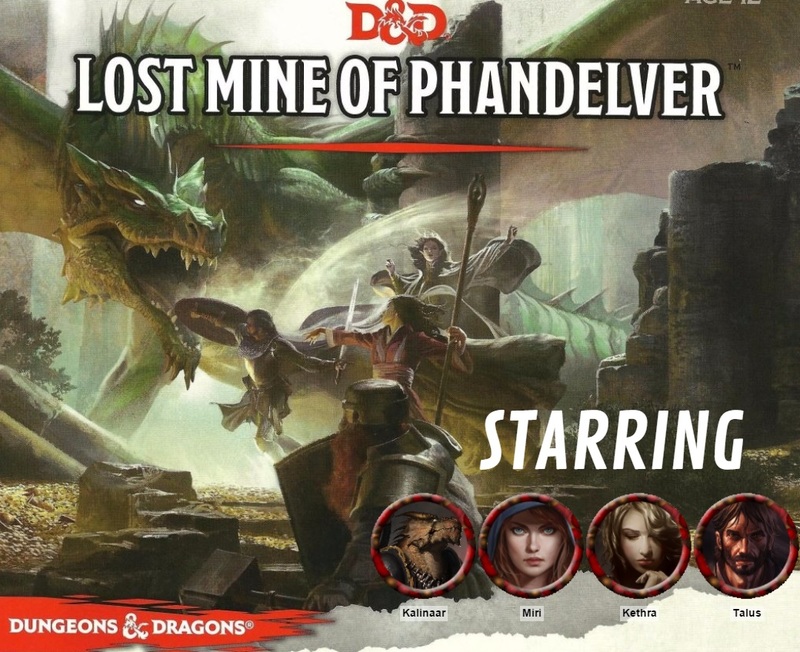 “Lost Mine of Phandelver” includes a rather unique creature called a Nothic – an insane, twisted former mage with clawed hands and a single eye. 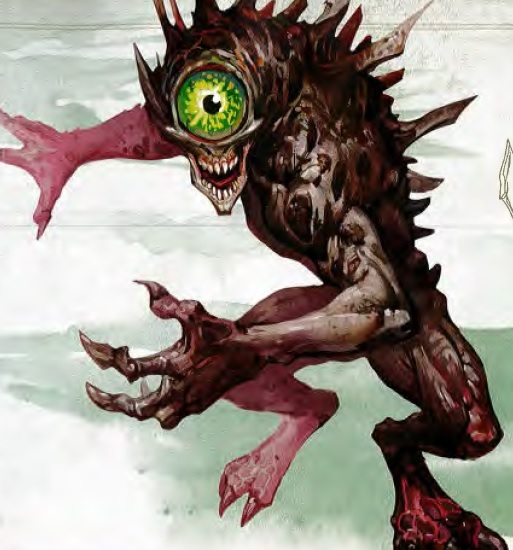 It feeds on flesh and communicates telepathically – a wonderful excuse to unnerve my players as it steels into their minds, searches for their secrets and their past while gibbering about rending, tearing, GNAWING, biting, feeeediiiing. It was a lot of fun, but I’m getting ahead of myself. 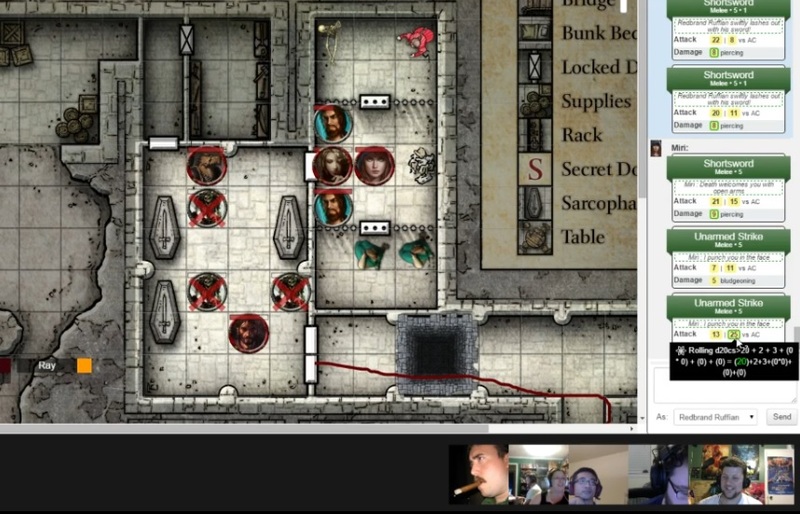 Our session opened after the party had just settled down for a Short Rest at the beginning of the Redbrand Hideout dungeon. If the Cragmaw Hideout was the level 1 newbie dungon, then the Redbrand Hideout is the level 2 sequel. It’s a bit larger, with slightly tougher enemies and some nifty traps, locked doors, and false walls. I really love the layout – a cellar that’s been excavated and expanded to act as a base of operations for the organized thugs. I also love that it’s not simply crawling with the human warriors but includes other foes as well, such as the animated skeletons set to guard the crypt, and the Nothic with its magic crevasse full of half-decaying corpses. The party wisely had the rogue surge ahead, but while Kethra was intent on sneaking everywhere, she was not so keen on looking for traps. She triggered the pit on the East side of the map, but thanks to a lucky Dexterity Saving Throw, avoided falling 20 feet into the pit. The PCs all spent some time trying to get around the pit, and I realized the brilliance of including a trap like this early on – it creates a dangerous atmosphere that cautions the players to tread much more slowly and carefully. The heaviest character, Kalinaar the dragonborn paladin, tried to skirt the ledge, failed the Acrobatics check, and fell. He had a rope wrapped around his waist, but the other players rolled horribly on their Strength checks. I let them roleplay the situation a bit and allowed Miri to award her Inspiration to Kethra, giving them just the edge to pull Kalinaar up to safety. Afterward they attached the rope to various doors once the more Dex-focused rogue Kethra crossed the threshold, creating a rather brilliant handrail. Players were using Inspiration left and right to avoid falling, and while I was a bit more cavalier with rewarding it, I also felt like everyone is nicely settling into their roles and role-playing a bit more, much to my liking. The guarding skeletons in the crypt were spotted thanks to Kalinaar’s Divine Sense, and skeletons in Fifth Edition are only barely better than goblins. They went down swiftly. The added confidence nearly got one of them killed in the next room as Kethra stealthily walked in and was swiftly pounced by a pair of Redbrands waiting on the other side. I rolled 20+ on both attacks and max damage, nearly dropping her unconscious in a single surprise round. Still, two Redbrands are no match for the full party, and after a healing potion Kethra was able to return to the fight and deliver the final killing blow. The PCs freed the captive Mirna and her teenage children, and the grateful woman told them of a valuable heirloom she left behind in the ruined town of Thundertree. I found the small North hallway hilarious, as my players were rather terrified given the massive pit that was in the last hallway. The wizard Talus used Mage Hand to open most of the doors, just in case. Ironically, looking for traps in the small space revealed the secret passage on the opposite side of the door, something they mighty not have found otherwise. Beyond the locked door the PCs found a stockpile of weapons, and both the rogue and wizard grabbed crossbows, which would come in handy for the upcoming battle. If there was a mid-dungeon mini-boss, it would be the Nothic. The cellar opens up into a large natural cavern, home to the subterranean terror. I had a ton of fun voicing this otherworldly creature as it dipped into the PCs’ minds. I used a deluge of voices including growls and whispers to convey its insane gibberings as it strung together thoughts and desires rather than full sentences. I was toying with the idea of ending the session upon its encounter as a neat cliffhanger. But after my players’ reactions I decided to press forward, not wanting to recap this feeling of unknown dread to try and recreate the mood next week. The unflinching paladin responded accordingly, drawing his blade and readying for battle. I tried to have the Nothic bargain with the PCs by asking for food – bodies, specifically. I used its Weird Insight on each character, letting it worm its away inside their minds, trying to deduce their thoughts and feelings. My players were really impressed by the whole horrific scenario, but in the end none of them were willing to bargain with it. Even still, I had the Nothic hang back, not wanting to engage with them directly – until they burned the bodies. Talus hurled a firebolt down into the pit of corpses (we joked that it was the only time he’s ever been able to hit anything with it), lighting them on fire. The carrion eater shrieked and attacked them right on the bridge. The Nothic isn’t particularly powerful. It’s CR 2, which means it’s a decent, but very doable fight for four adventurers. I only got two rounds off with it and missed with both attacks – its Rotting Gaze and double claws. The PCs lit it up with nearly every attack, taking off small chunks of damage that added up quickly – so many annoying darts and crossbow bolts! They didn’t end up taking any damage at all. In fact the only one to take any damage all evening was Kethra during the Redbrand sneak attack. Such is the luck of the dice. We ended the 2.5 hour session with the Nothic slain, and the Western half of the cavern waiting to be explored. I originally thought we’d complete all of this dungeon this week. Battles take some time but not nearly as long as Shadowrun. I didn’t realize that the pit would take quite a while to get past, and from then on the PCs explored much more slower and cautiously. We’re about 2/3 of the way through the hideout, and should definitely be reaching level 3 next week. From there the adventure really opens up, and it’ll be interesting to see where our PCs go from here.